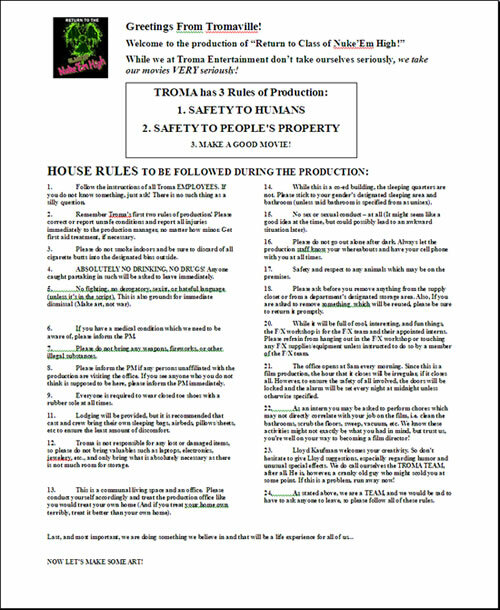 Check out the cast and crew rules for the upcoming production of Return to Class of Nuke’Em High! This entry was posted on Thursday, July 19th, 2012 at 5:32 pm	and is filed under News. You can follow any responses to this entry through the RSS 2.0 feed. You can leave a response, or trackback from your own site. I would love to be a part of this! I am an inspiring film director and I have loved troma studios for years! How do we find info about trying to join up?